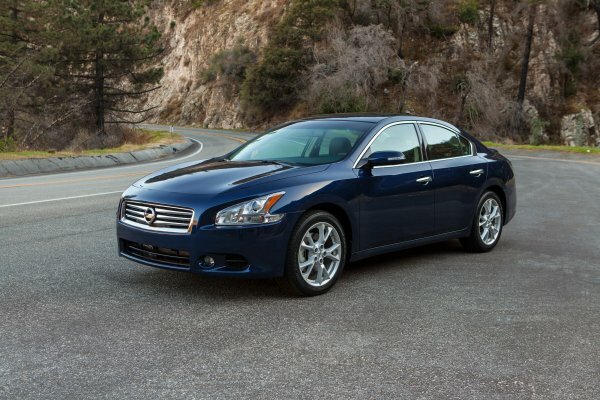 Nissan has revealed pricing on the 2014 Maxima, their flagship sedan and top-level premium model under the Nissan nameplate. The car goes on sale at dealerships nationally immediately. The Maxima is noted for its extreme comfort level, sports sedan styling, efficiency and luxury. The 2014 model keeps the well-received 3.5-liter dual overhead cam (DOHC), 24-valve VQ-series V6 engine with its 290 horsepower of output through the standard Xtronic continuously variable transmission (CVT). This CVT offers manual and drive sport (DS) modes and paddle shifters are available. Two new exterior colors are being offered for 2014, including Gun Metallic and Midnight Garnet, making for eight total exterior color options. The SV model upgrade adds several standard features, including RearView Monitor, USB connectivity, a 7-inch color monitor, and Xenon headlamps. A new Limited Edition Package is also available on 3.5 S models, adding smoked Xenon headlights, 18-inch aluminum Dark Hyper Silver wheels, a rear spoiler, fog lights, and metallic trim treatment, among other upgrades. This package is added at just $750. Technology upgrades can be purchased in packages or individually to include a Bose premium audio system with nine speakers, a Nissan Hard Drive Navigation system with NavTraffic Real-Time Traffic Info and NavWeather, as well as Voice Recognition. The Maxima begins at the Maxima 3.5 S base level at $31,000 plus $810 destination. The Maxima 3.5 SV model begins at $34,090 plus $810 destination.